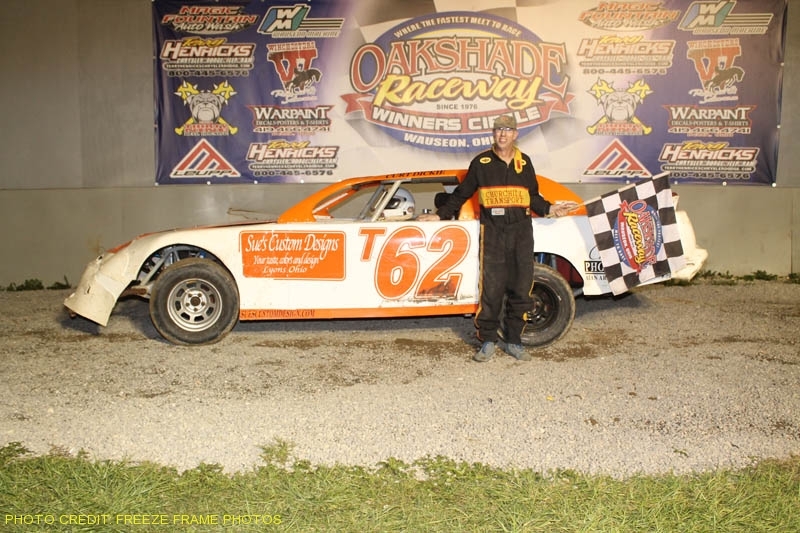 For the second week in a row, some last lap heroics helped Rusty Schlenk notch another UMP Late Model feature win at Oakshade Raceway on Leupp Outdoor Equipment Night. Jon Henry started on the pole of the Leupp Outdoor Equipment American Late Model Series (ALMS) feature event and after disposing of Dusty Moore went on to open a commanding lead over the rest of the field. Schlenk got by Matt Miller and Dusty Moore to move up to second and then began to chip away at the half-lap lead Henry had built. A late race caution tightened up the field for a restart with just two laps remaining. Schlenk capitalized on the opportunity by jumping to the outside of the ALMS point leader for the race lead on the final lap. For the second time in as many weeks, Schlenk led only one lap, but it was the lap that counted. Schlenk picked up his third Oakshade feature win of the year and a $2,000 ALMS pay day. Henry, in a special coloring contest paint scheme, settled for a second place finish. Jeep Van Wormer got by Dusty Moore late in the race to finish third and Matt Miller wound up fifth. It was family battle early in the Leupp Outdoor Equipment UMP Sportsman feature between Bob Gregory and B.J. Gregory as the two drivers battled side by side for the lead in the first part of the race. George Lindsey was quietly working his way up toward the front and took second by lap 12 and then got to the inside of B.J. Gregory for the race lead one lap later. A late caution with three laps to go for Jerry Urbanowski’s spin bunched up the field for the restart and allowed B.J. Gregory one last shot at the lead, but Lindsey’s car was just too strong and he picked up his second feature win of the year. B.J. Gregory held on to finish second with defending track champion Mike Jessen taking third. Bob Gregory slipped back to fourth and Bruce Stuart came home fifth. The Leupp Outdoor Equipment UMP Bomber A Main featured another great battle for the lead for much of the race. An early caution for a Chris Henry spin reset the field for a double-file restart with Jeff Geis leading. Jim Scout got by Jeff Foks for second and then moved to the outside of Geis to challenge for the lead. Scout led lap three, but Geis reclaimed the top spot two laps later as the two drivers continued racing side by side and exchanging the lead. Geis was stronger running the inside so Scout tried to move down to the bottom after regaining the lead so that Geis would have to try to pass on the high side. That move worked and earned Scout his third UMP Bomber A Main win of the year and moved him back to within six points of Bomber point leader Terry Rushlow. Jeff Foks edged out Geis at the finish to take second. Joe Overmyer ended up fourth followed by Adam Noonan in fifth. Drew Smith dominated the Leupp Outdoor Equipment Hornet feature event to pick up his third feature win of the year. Brandon Myers appeared to have a fast car but drove a bit too deep into turn one and over-corrected into the side of Regan Ford to bring out a caution on lap two which ended Myers’ night. Ford continued on without stopping. Sharlene Reeves brought out another caution flag for a spin on lap three. From then on it was smooth sailing for Drew Smith who went on to the easy victory over Taylor Dippman, William Cundick, Breanna Franks and Cody Stetten. Scott Robertson grabbed the early lead in the UMP Bomber B Main but fell off the pace coming off turn four just as he was about to complete the first lap. That turned the lead over to Ron Tolles. Danny Hogrefe closed in and pressured Tolles for the lead by lap four. Hogrefe took the lead on the inside of Tolles just as Tom Hough was spinning right in front of the leaders. Another late caution with Hogrefe leading allowed Tolles one last attempt to take the lead. Tolles got to the inside of Hogrefe and the two drivers were side by side as the white flag waved. Hogrefe was able to hold off Tolles for the win. Donovan Paskan finished third with John Gamber fourth. Chris Howard started 17th and worked his way up to a fifth place finish. Oakshade Raceway will host the 22nd Annual Barney Oldfield Race for UMP Late Models paying $4,700 to the winner on Saturday, June 25. UMP Sportsman, UMP Bombers and Hornets will also be in action with gates opening at 4pm and racing starting at 7pm.